Many men do not like a large bulky wallet to sit on so they have their cash in a front pocket and it may surround some credit or bank cards. To keep the cash organized many men will use a rubber band, paper clip, or nothing at all and lose money due to it floating around in their pants pocket. One way to alleviate losing money or a card or perhaps an important photo is with out titanium engravable money clip. Money clips are often seen as a sign of an organized, thoughtful, financially savvy sign of a man. They are also seen as luxury and a sign of class and dignity and with our titanium engravable money clip this holds especially true. 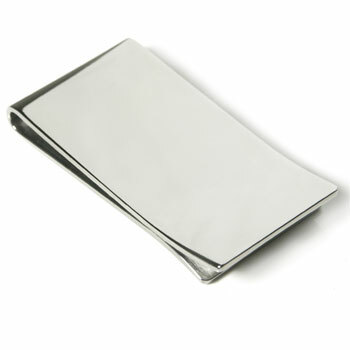 Made of titanium the men's money clip will not bend like those made of aluminum, brass, or tin. Also with our engraving service the money clip becomes a very personal and thoughtful gift with your words engraved on the surface.